Every year at the Web 2.0 Summit, Morgan Stanley Internet analyst Mary Meeker gives her view of the world, the Web, and the technology industry by quickly going through about 50 slides that illustrate the major trends she is tracking. Last year, she zeroed in on the China Bubble. This year, she talks about the root causes of the current economic downturn, the outlook for Web businesses, and where she still sees major growth (mobile and emerging markets). She singles out the mobile industry as the one where both the most opportunity will be found and disruption will occur over the next five years. Moreover, she suggests that the U.S. is poised to lead the transition in mobile to a Web-centric model. (I totally agree). Interestingly, she points to the introduction of the first Android phone by T-Mobile, not the launch of the iPhone, as the key inflection point for the coming era of the mobile web. A few slides in particular stuck out for me. First, the growth rates for both e-commerce sales and Internet advertising are normalizing much faster than anyone expected they would compared to offline growth rates for retail sales and advertising. No doubt, this steep slowdown in growth is being compounded by the overall economic situation. 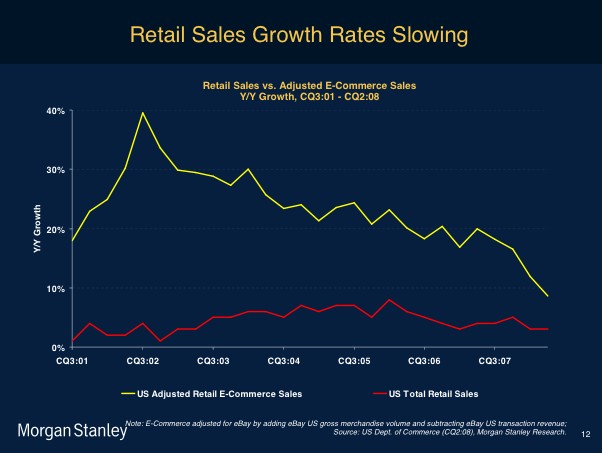 In the first slide below, the red line is U.S. retail sales growth and the yellow line is e-commerce sales growth. See where the yellow line is headed? 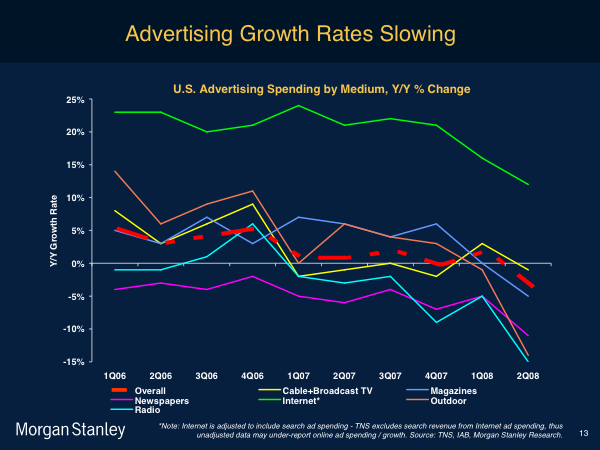 In the second slide, the top green line is Internet advertising growth. 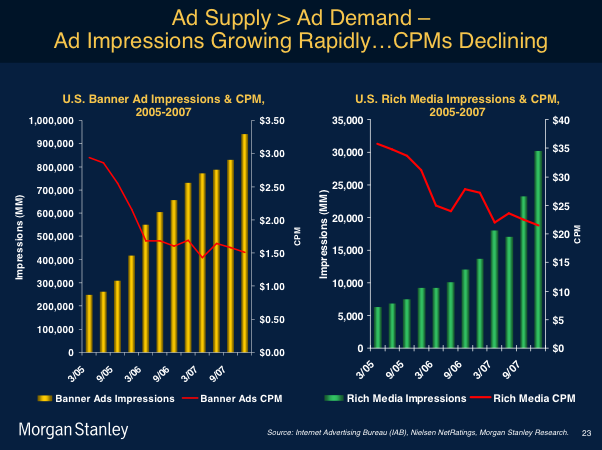 At least it is still above all the other kinds of advertising and not yet in negative territory, but the trend does not look good. 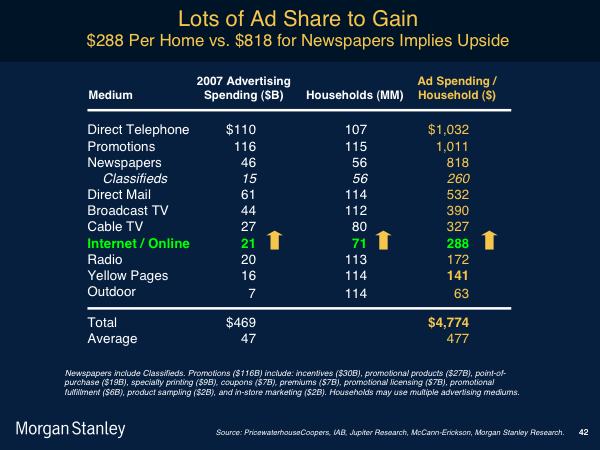 On the bright side, compared to the overall spending on other forms of advertising such as TV, print, and direct mail, Internet advertising still has a lot of share to gain, and will likely continue to do so.